Every parent knows how precious those extra couple of hours of sleep are on the weekend. But if your little early risers are in the habit of barging into your bedroom at 7 AM on a Sunday, this room is for you. 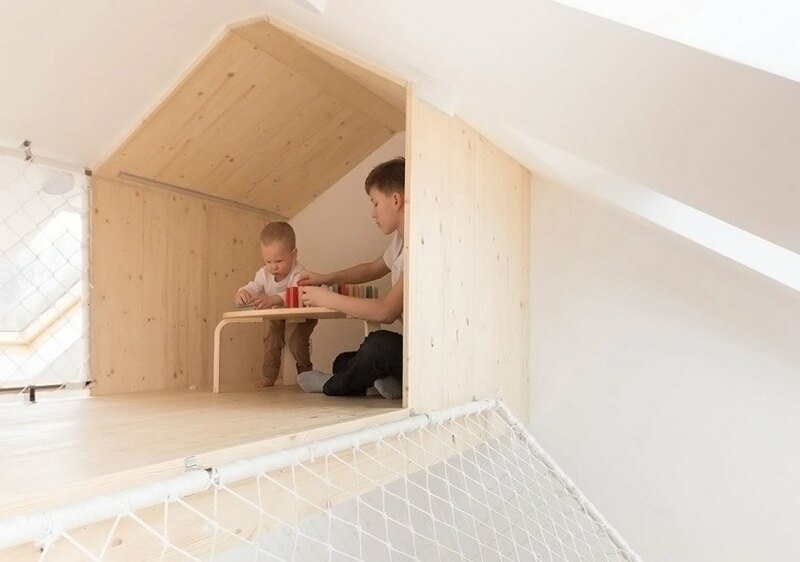 Russian architecture studio Ruetemple has created the perfect solution for a family of four that keeps kids occupied and allows mom and dad to stay in bed a bit longer. 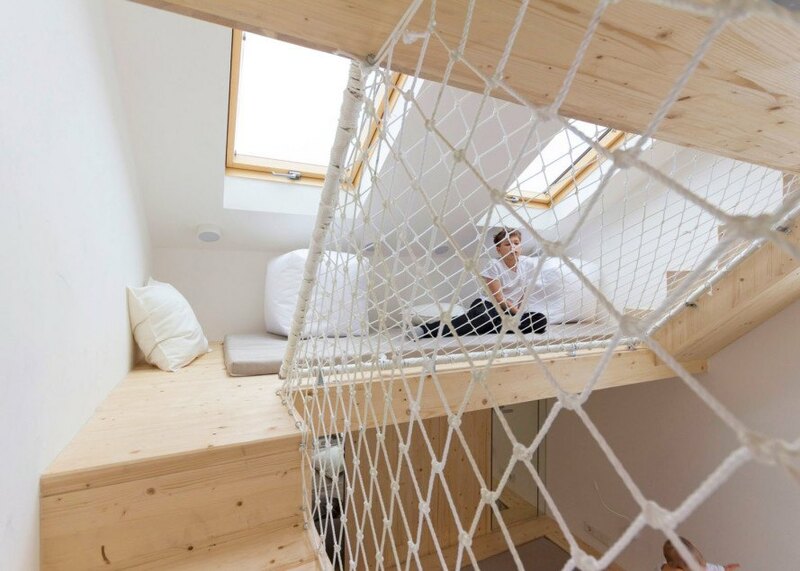 The studio designed a master bedroom with a multi-level play area above the bed, incorporating a small playhouse and secret room. The owners commissioned Ruetemple to design an unusual master bedroom inside their summer house in Russia. They came up with a design that keeps everyone happy. The room now has a large podium for the bed, with two upper levels and a staircase for the kids. The entire structure is built using timber and pine, while the remaining walls are painted white. White nets protect the kids from falling and allow them to climb and play without the fear of injury. On the ground level, a mirrored door hides a secret room. Natural light reaches the room through skylights and large windows. 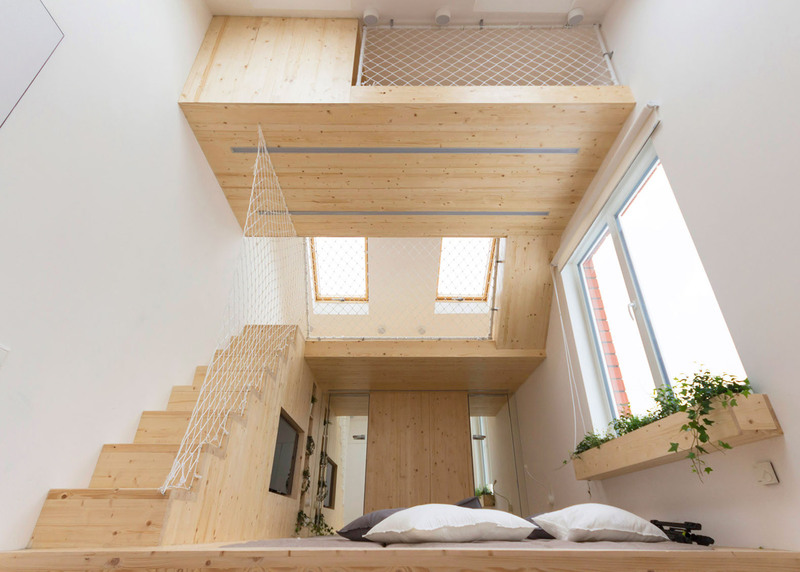 The owners commissioned Ruetemple to design an unusual master bedroom inside their summer house in Russia. They came up with a design that keeps everyone happy. The room now has a large podium for the bed, with two upper levels and a staircase for the kids. "The family comes to their summer house for the weekend and, like all working people, they dream of having a good sleep on Saturday and Sunday after a hard week in town," said the architects. "But all the children are early birds. They wake their parents up early in the morning." The entire structure is built using timber and pine, while the remaining walls are painted white. White nets protect the kids from falling and allow them to climb and play without the fear of injury. On the ground level, a mirrored door hides a secret room. Natural light reaches the room through skylights and large windows.